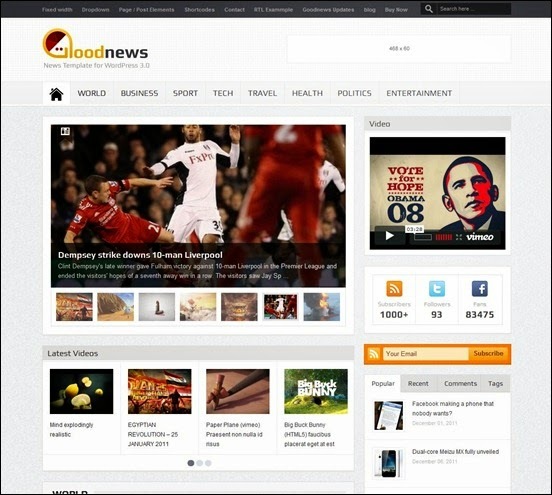 GoodNews Responsive Blogger Template is a WordPress Converted Blogspot Theme (Originally Created by Momizat Team) from Good News WordPress Theme. This web-design is converted by Uong Jowo a best blogspot Themes developer. This web-design gives you many great features such as Adsense Ready, Fully Premium WordPress Look, Professional User Friendly Design, SEO Optimized with Advanced Search Engine Factors, Responsive Recent Post Slider, Box Search and Navigate system, Multi Tab, Responsive and Modern Design, Threaded Comments, Related Posts, Friendly Admin Layout, Adsense Ready having Bigger Ad spots etc. GoodNews Blogger Template is best choice to make you website more attractive and friendly for both users and search engines having fast loading speed. It has Professional layout style such as Multi Tabs options for various categories, 4 Footer Columns, WP like Professional Social Media Sharing Icons on Footer and Header, Beautiful Search Bar, Awesome Drop-Down Menus with Smooth results and much more. GoodNews Responsive Blogger Template Support all type of browsers and Screen resolutions of any electronic devices such as Apple iPad, iPod, Android Phones and Tablets, Computer and Laptops etc.It has Premium look Content Featured Image Slider, Popular Posts widget with multi tabs etc. In Other words Good News Blogger Template is fully widget ready.